Just ignore this post if you don't care about scrapbooking. But I know have (at least) two readers who care because they share the hobby. I know I like to see their pages (Hint, Shelley ...) so I'm only assuming they don't mind seeing mine. Yep, that's Basic Grey. My FAVORITE. I love those coordinating packets of the different lines. Here, I was going for water at the bottom and earth on the top, like a subtle contrast. i love basic grey too! It and rusty pickle are my current faves. i haven't seen that paper. I love it. It's girly! I can't wait to go shopping for her first album. I worked with you at the News in college, but I found your blog through Alyson (McNutt) English. I've lurked on your blog a couple of times, and I love seeing your scrapbook pages. 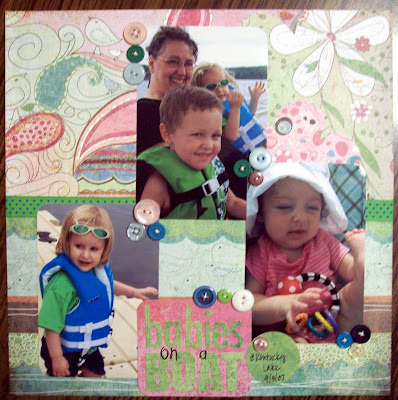 As a scrapbooker, they provide me some great inspiration! You are really good!